Most people who own a coffee maker tend to buy pre-ground coffee because it’s more convenient to use when it comes to brewing a fresh cup of coffee. However, coffee enthusiasts stick to using freshly ground coffee beans over pre-ground beans because it adds a fresher flavor to every cup of coffee. People who prefer freshly ground coffee beans either put their grinder and brewer side by side or they buy a two in one coffee maker. For convenience and to save space, it’s better to have a grind and brew coffee maker. It can give you the benefit of freshly ground coffee in every cup. You do not have to worry about anything because the machine can do it for you. So if you want to wake up every morning to the aroma of freshly ground coffee, here are the top grind and brew coffee makers we found that you might like. This coffee maker is a convenient and time saving unit. It combines features designed to offer convenience and ease with high quality coffee brewing. If you want to wake up to a freshly brewed cup of coffee, this coffee maker has a clock timer that offers you the option for setting the automatic grind and brew feature up to 24 hours in advance. The grinder of this coffee maker has 7 different settings making it possible for you to achieve the perfect grind for the best cup of coffee. It also has a stainless steel filter basket which is easy to remove and clean, better than disposable filters. This coffee maker stands out from other similar models because of its customizability. It comes with 8-strenght settings that can cater a wide range of customer needs, enabling them to brew their perfect cup of coffee. It is programmable and its grinder has 6 different fineness settings. Aside from whole coffee beans, you can also use pre-ground coffee in this coffee maker by just selecting the pre-ground mode. It can also accommodate travel mugs of varying sizes such as those as tall as 7.5 inches. This coffee maker is very easy to clean as well. You just have to make sure that you clean the filter often to avoid clogging up. This coffee maker is compact but is packed with convenience. When it comes in the world of gourmet home coffee making, Krups is one of the trusted names. This coffee maker is automatic and comes with a built-in conical burr grinder that will give you a flavorful cup of coffee. The size of the grind can also be adjusted, enabling you to brew different kinds of coffee drinks. Aside from its adjustable settings, it also has an LCD panel, Thermoblock technology for consistent, quick, and effective heating. It also features an automated hydraulic tamping system, meaning, you will be able to get a cup of coffee that tastes like it was made by an expert barista. This coffee maker is best for people who are design conscious and looking for an excellent coffee and espresso brewer at the same time. This coffee maker features multiple settings to adjust the flavor and strength of the brew. It is also programmable and you can set it up to brew you wake-up coffee or off-work coffee. It has 5 delightful fineness settings, however, it can be loud and the process lasts for a few seconds longer compared to other average grinders. Longevity is not an issue with this coffee maker because it is made with high-quality materials. 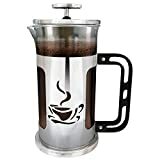 It is very useful especially on time when you feel too lazy to brew. This coffee maker will enable you to grind fresh coffee beans and quickly brew it for a great cup of coffee. This is convenient to use especially for busy people because it can be pre-programmed. It has 24-hour programming feature that will allow you to preset the automatic grind and brew options. You can also use pre-ground coffee instead of while beans. Just choose the option to turn the grinder off. This coffee maker is highly adjustable, enabling you to set the grind size and coffee strength to suit your taste. It has a clear viewing window letting you see how much water is inside the machine. It can hold up to 12 cups of coffee and it uses a permanent filtering system that is easy to remove and clean. 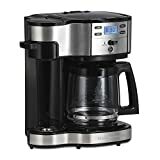 Whether you choose to brew freshly ground coffee or pre-ground coffee, this coffee maker will provide you with the aroma of fresh brewed coffee. PROGRAMMABLE: The program button allows you to easily control when your coffee brews. Pre-program the night before and know that tomorrow’s breakfast will be with perfect taste! This coffee maker can brew a delightful cup of coffee right out of freshly ground beans. You can set it up to brew coffee on its own because it’s programmable. It can brew 12 cups of coffee, or just a cup or two with its 1-4 cup brew function. This coffee maker comes with a glass carafe that has a hot plate. It’s not that energy efficient, but it will be able to keep your coffee hot for about 2 hours. Its grinding process is loud but it only lasts for a few seconds. If you’re looking for a coffee-maker with grinder that is less than $100, then this is the perfect choice. This is a super-automatic coffee machine, meaning, it is a step further compared to self-grinding coffee maker models. It can produce cappuccino, espresso, and traditional coffee in an instant. This coffee maker has a Direct-to-Brew system that can grind your preferred coffee beans to perfection, then begins the coffee making process on its own. You can also adjust the grind size in seconds by using the dial on front of the machine. It also comes with a warming cup tray which can keep your coffee hot and ready to drink. If you want to create coffeehouse quality drinks without spending too much time and effort, this coffee maker is the best for you. For those who want to brew their own personalized cup of coffee, having this coffee maker is like a dream-come-true. Though it can be pricey, its functionality can outweigh its price. This coffee maker is semi-automatic, meaning, you can customize your coffee from grind dosage to grind fineness, as well as water temperature, and tamp pressure. It will allow you to experiment and set up to your personal standards for you to have your definition of the perfect espresso. However, this coffee machine is bulkier compared to other models, but it is solid, durable, and long-lasting than those space-serving ones. This coffee maker can create the best tasting cups of coffee in a convenient way because it does not sacrifice flavor by grinding up fresh whole beans in an instant. It has programmable settings which are easy to use, and a digital display making it easy for you to see the options you’ve chosen. Aside from using whole beans, you can also use pre-ground coffee with this coffee maker because it has a pre-ground setting. This coffee maker has a contemporary appeal making it aesthetically attractive. It has a stainless steel and black façade, making it easy to fit into most kitchen décor styles and designs. If you do not have much space on your kitchen counter, this is a great choice because it only measures 11 by 7 by 12 inches. 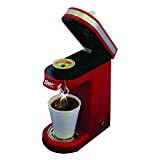 If you’re someone who craves for different types of coffee drinks, then this coffee machine is perfect for you. Some coffee lovers buy different coffee makers to be able to brew different kinds of coffee drinks, but with this single unit, you will be able to grind and brew a variety of drinks conveniently. This is an ultimate coffee grinder and brewer that can turn out an espresso, a cappuccino, or a strong cup of joe in just a minute. Having this coffee maker at home is like having your own pro barista without spending too much. It is a reliable, good-looking, and easy to use espresso maker. We hope our top picks for grind and brew coffee makers will be able to help you find the perfect one that will suit your taste. Aside from giving you a delicious cup of freshly brewed coffee, these models will also help you save money compared to purchasing a grinder and a brewer separately.